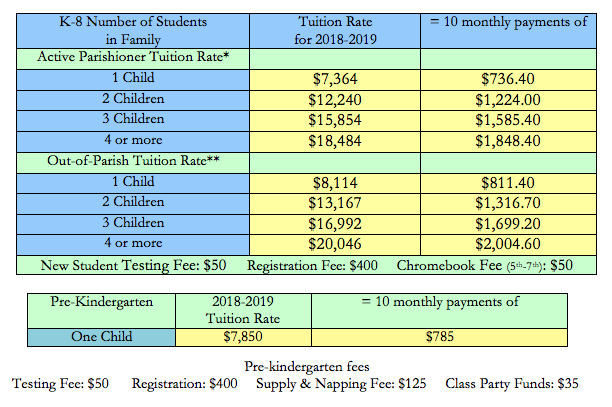 St. John Catholic School currently has a two-tier tuition rate: active parishioners and out-of-parish. There is a discount available for siblings. Please contact the school for specific tuition rates for your family. *Active Parishioner Tuition applies to families who are registered in our St. John the Baptist parish and regularly attend weekend mass, whose children have completed all age appropriate sacraments, contribute financial support directly to the school by monetary donations or regular contributions to the Annual Fund or to the parish through the use of weekly envelopes or EFT, and participate in liturgy. ﻿Please contact our office with questions about tuition and tuition assistance. We are pleased to partner with F.A.C.E. and BASIC to provide generous support to qualifying families, making the gift of Catholic education accessible to you. Please note, Private School Aid Services, has been replaced by FACTS Grant and Aid. Please use the FACTS Grant and Aid application to apply to F.A.C.E.